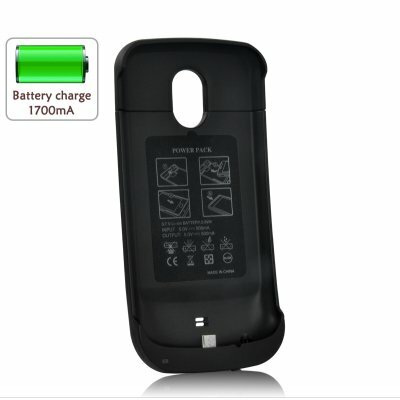 Successfully Added Ultra-Thin Battery Power Pack Case for Samsung Galaxy Nexus I9250 (1700 mAh) to your Shopping Cart. Ultra-thin Backup Battery Power Pack Case for the Samsung Galaxy Nexus I9250. The case is a perfect fit that not only protects your smartphone, but also nearly doubles its usage with an extra 1700 mAh of battery power. The Samsung Galaxy Nexus is the hottest Android device right now, featuring Google's newest Android 4.0 ICS, dual-core 1.2GHz CPUs, and an eye-catching 4.65 inch HD super AMOLED screen that measures 1280 by 720. But the cost of all that marvel is battery life, which is why this Battery Power Pack Case is a must-have accessory. The ultra-thin design adds a hardly-noticeable extra layer to your Nexus while providing a massive 1700 mAh battery boost (offering almost twice as much power) for hours and hours more of talking, playing, and working. Made specifically for the Samsung Galaxy Nexus, this Extended Battery Power Pack Case provides a perfect fit and flawless compatibility with your phone. Cut-outs are available for the camera, speaker, microphone, headphone jack, micro USB slot, and side buttons, so you can still utilize the full functionality of your phone without having to take it out of the case. Even better, the ultra-thin case goes along with the thin and sleek feel of the original smartphone it was meant for. Give your Samsung Galaxy Nexus twice as much love with this 1700 mAh Ultra-Thin Battery Power Pack Case. Available in our warehouse right now, order today and we'll express ship this Ultra-Thin Extended Battery Power Pack Case tomorrow. Brought to you by the leader in wholesale electronics. on 2012-05-14 11:34:14 Looking to juice your Nexus? Look no further. I love my new Galaxy Nexus bit I'm shocked at the pitiful battery life. True, I was coming from an 6 yr old Palm Treo that could go for 4 days between charges but still, 8 hours of normal use and it needs a charge!? I guess that's modern smart phones for ya. My only other complaint about the galaxy nexus was that it was too slim and slippery in my hand. This battery pack has solved both problems. The battery lasts longer (not quite twice but at least 1.75% longer) and it give the phone the heft I need. Be forewarned that it does make the entire phone about twice as thick. For me that's a good thing but many people will be unhappy that their svelte little phone suddenly seems ready to give birth to a pager. TLDR: Gives you about 75% more battery life and doubles the thickness and weight of your phone.